If you remove the ideas of misogyny from the narrative of Ex Machina and replace it with hard-hitting action sequences, you would have Morgan. Little about the screenplay is original, but something about allowing two women to head up a majority of battles (both verbal and hand-to-hand) still feels innovative. Even if the screenplay itself is not nearly as intelligent as the initial setup seems to imply, and despite being able to predict the final twist less than halfway through the movie, I remained engaged with the performers and the world that they created until the last frame. Since we have seen the man-made creation-gone-wrong narrative countless times before, I was thankful to discover that Morgan does not force us to endure the creation process. We join the narrative much in the same way as Ex Machina, alongside a newcomer arriving to witness and evaluate the project’s progress and set-backs. Lee Weathers (Kate Mara) is a corporate risk-management consultant sent to decide the viability of the project after a violent outburst occurs. 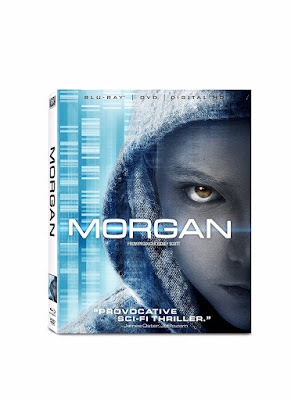 The artificially created humanoid known as Morgan (Anya Taylor-Joy) is usually controlled, though the investigation discovers that her human emotions can lead to sudden eruptions when pushed too far. In effect, she has temper tantrums which are far more brutal than would be possible from a human the same age, especially because of her accelerated growth. The first of these outbursts occurs in the film’s first scene, not long after Morgan has been restricted from outside excursions. Even though she ruthlessly attacks one of the doctors on the project (Jennifer Jason Leigh), the victim and many of the other doctors are quick to defend Morgan. Part of the problem is that this group of doctors (Toby Jones, Michelle Yeoh, Chris Sullivan, Rose Leslie) have raised Morgan from infancy, and are blinded by their feelings of paternal obligation. Only the project’s cook (Boyd Holbrook) doesn’t have a bias towards the creation, with the exception of a completely illogical and brief appearance by a psychologist (Paul Giamatti) brought in to instigate a response from Morgan, with little consideration for the outcome. At about the same time that violence is forced out of Morgan as a way of proving the instability of the project, the film begins to devolve into an action movie where many of the characters are driven by illogical emotions. Perhaps this was meant as a commentary on the instability of humans, and the inevitability that Morgan would carry these same traits alongside her superhuman strength. But I still couldn’t help but wonder who it was that taught the cyber-being martial arts in the first place. Whether the action is meant to be an extension of the film’s ideas or merely a bit of extraneous spectacle, the larger ideas of the film take backseat to the thrills during the second half of the narrative. Despite devolving into pure spectacle, the visual style of the film is actually quite subdued. Other than an odd look to her eyes, Morgan mostly just looks human. This is not very heavy sci-fi, even if the ideas within the story have been used as such in the past. This doesn’t mean that the Blu-ray is unnecessary, though the high definition is a luxury rather than a necessity for a film like this. Morgan is director Luke Scott’s feature-film debut, though one of his short films (LOOM) is included in the special features, with an optional commentary track from the filmmaker. Scott also provides an audio commentary for the feature film, as well as the handful of deleted scenes also included in the extras. There is also a gallery of still photos and a featurette about the actual science behind the film’s concept. *** The Blu-ray release comes with a Digital HD copy, though it is currently not available through Ultraviolet, as advertised. This problem may be resolved soon, but as of 12/18/16, this is what I know: The Blu-ray includes the usual code for adding to your digital library, but the code doesn’t work since they have yet to add the film into their system. I contacted Ultraviolet to let them know that this title was not available and the code entered brings up an error as a result. I didn’t let Ultraviolet know that I am a critic who has been sent the release by the studio itself for review purposes, because I wanted to see how they would treat the average consumer. It turns out they treat them like common thieves. When I politely informed them of the missing films (several of this past week’s other releases are suspiciously missing, including Southside With Me, “Harley and the Davidsons,” and Morgan), they asked me to send them a receipt of purchase, proving I had actually bought the films. What’s even more frustrating than the implication of this request is the fact that it does nothing to address the real problem. Code or no code, receipt or no receipt, it does nothing to change the fact that the films are not even entered into the Ultraviolet system to begin with. I don’t know if the studios using this system are aware of the problems, but consumers should know what they are paying for, and as of 12/18/16 it is not a digital copy.